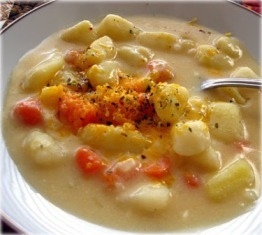 Potato soup is great for those night that are cold. A perfect meal for the whole family to enjoy! Put in a pot the water, potatoes, onion, celery, carrots, thyme, salt, pepper, and parsley. Simmer for about 20 minutes until the vegetables are tender. Pour the milk and stir the flour or ultra gel and allow to thicken. Stir in the cheese and allow it to melt then serve!